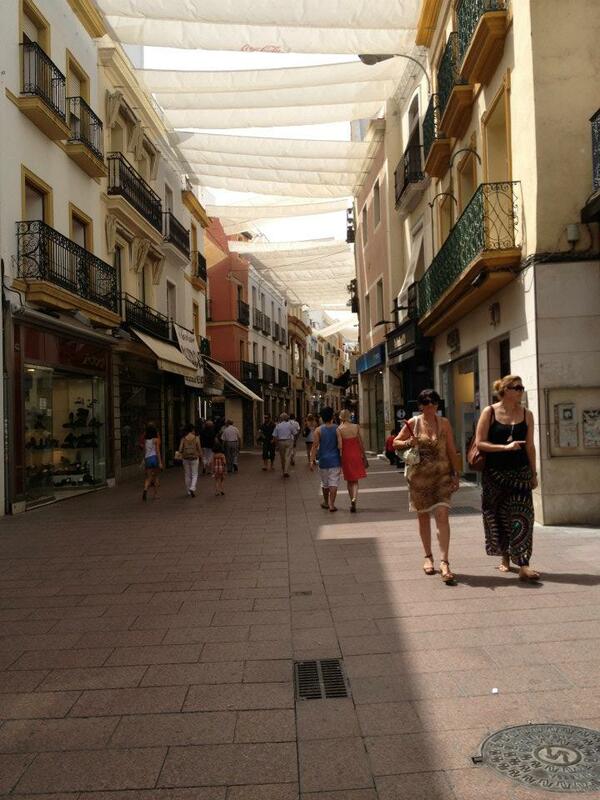 Yesterday was my last day in Sevilla, and was definitely a day well spent. 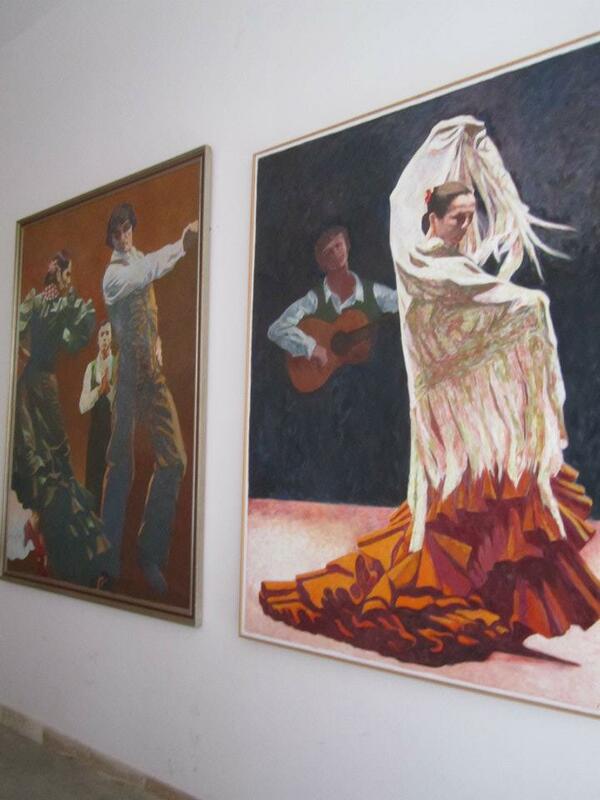 I woke up and made sure to check out el Museo de Flamenco Baile, which is a popular tourist attraction being that it’s the city’s most well known Flamenco museum and school. 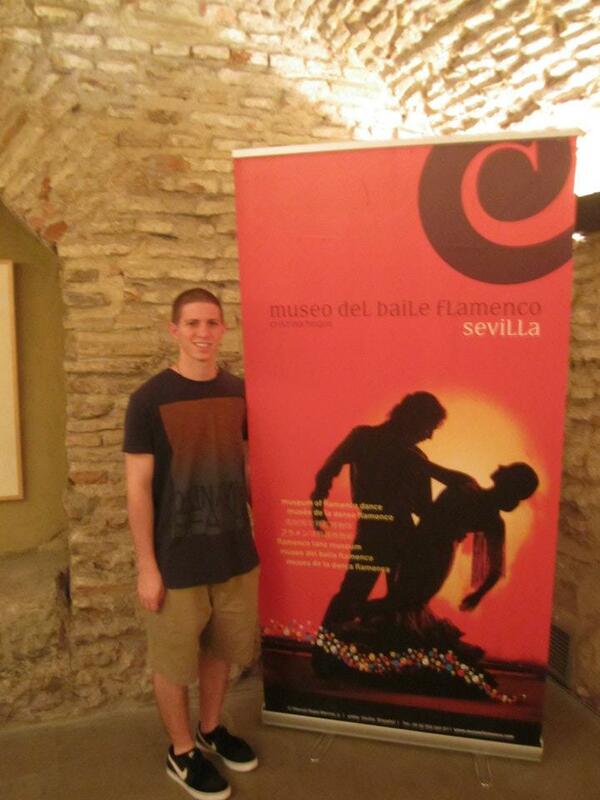 My friend and I walked around the museum, learning about the origin of the incredible dance, as well as the various types of flamenco dances there are, each based off emotions. 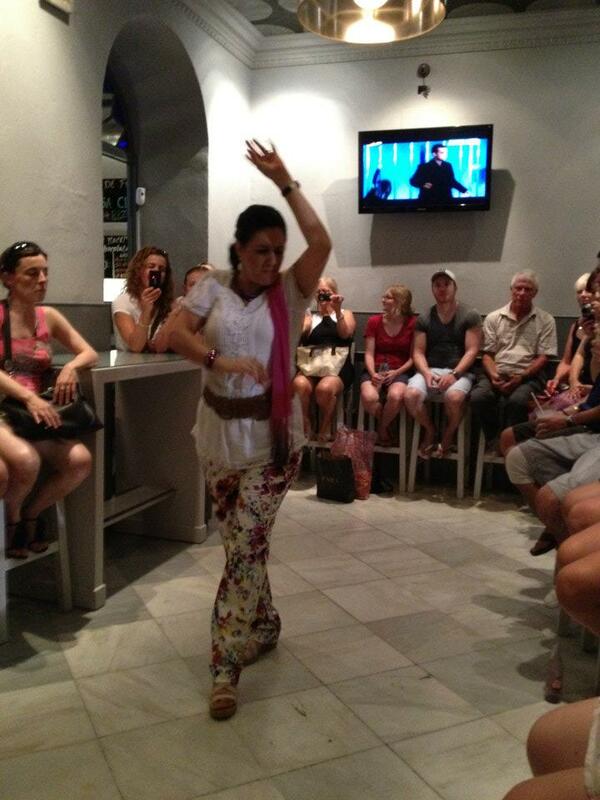 We got to see videos of the different dances and techniques and learned about great dancers of the past and present. After the museum, we grabbed lunch by La Giralda (the tower I mentioned in my previous post), and took in the city’s beauty before it was time for us to leave. 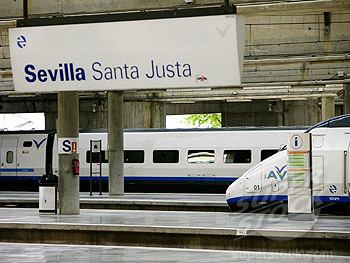 When we returned to the hotel, our suitcases had finally arrived, and we took a cab to the train station, and then a train to Madrid. 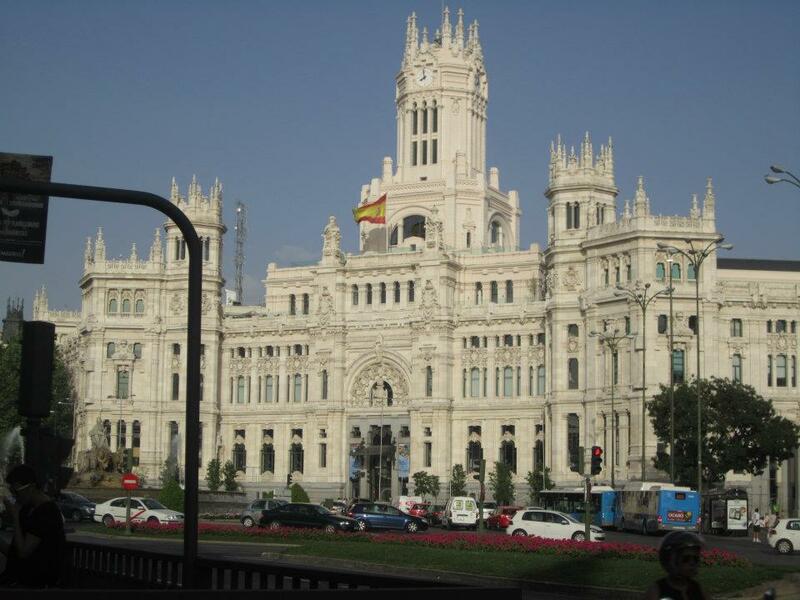 Upon arriving in Madrid, we boarded the metro to go to our hostel for the night. When we got off at our stop and exited the metro, we had to ask numerous people to point us in the direction of our hostel. After walking through the city with our luggage (for what seemed like forever), we finally made it to the hostel. Upon arriving at our new destination, we pushed the buzzer on the door and were let into the building. When we walked in, we noticed the huge spiral staircase that seemed like my worst nightmare. Just like the movies portray, we walked up two and a half flights of stairs, just to check in and be told that our room was on the next floor up. For those of you who, like me have never stayed in a hostel, well, don’t. (I’m kidding… kind of). There was no air conditioning, which normally wouldn’t be too bad, but considering that the only thing saving us from the 100+ degree weather was a small fan made the hostel quite an experience. And a tip for anyone planning on staying in a hostel anytime soon: when showering, make sure to hold your toiletries firmly or else you may end up dropping them in the toilet. (True story). My friend and I made sure to leave the room before we had time to suffocate, and we headed over to eat dinner, and then to a pub in the middle of the city to watch the Spain vs. Portugal Euro Cup game. The game was incredible, seeing as everyone around us was full of spirit and energy as they cheered on their team the whole time. 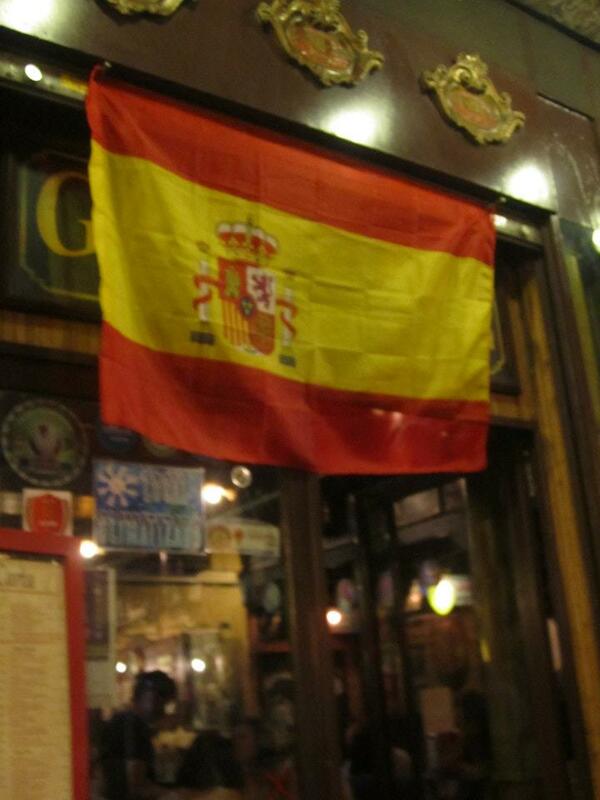 In the end, Spain was victorious and won during penalty kicks after overtime. The streets were filled with happy locals and the celebrations had begun since Spain was now going to compete in the Euro Cup finals. We headed back to the hostel to try and get some sleep before an early start this morning, but when the room was too hot for us to handle, we walked around the city to hang out with the locals, as they celebrated their victory. This morning we made our way to the Madrid Airport and met up with our group, because today was the first official day of our study abroad program. 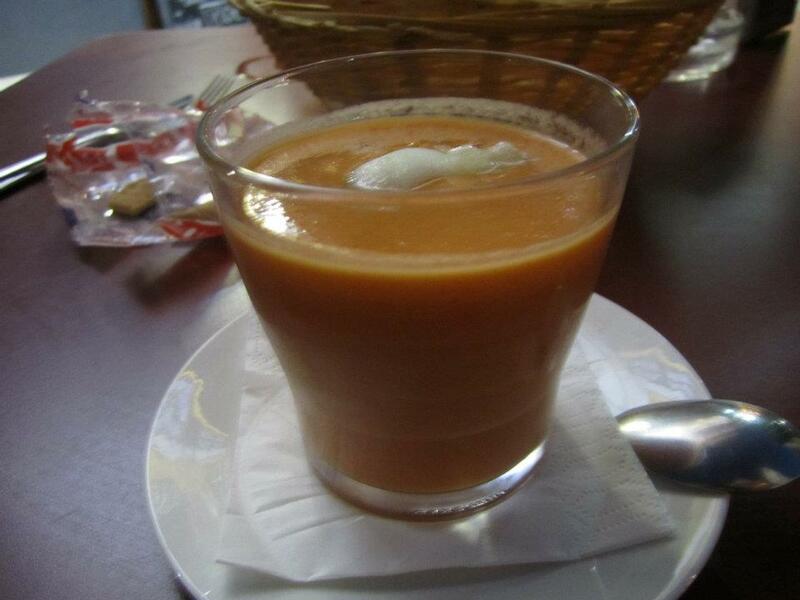 Once everyone had arrived, we all hopped on a bus to Álcala de Henares, where we met up with our host families. My host mom greeted me as I got off the bus, and graciously welcomed me into her apartment with her eight year-old son. My host mom speaks Spanish and German, and nowhere in between those two languages is English, so whatever Spanish I know will definitely come into use, and if I don’t learn fluent or almost fluent Spanish by the time I leave here, well, for the sake of my study abroad funds, I won’t have to worry about that. But the biggest culture shock so far (well, at least for today) had to be learning that most of the houses and apartments in Spain don’t have air conditioning, which is something I’m going to have to get used to. And quickly). I recently received a comment on my previous blog post asking me what the weather here is like, so if you still can’t tell (as I sit here sweating while writing this), it’s in the mid nineties at night and low one hundreds during the day. Hopefully the weather will cool down soon, but one can only hope so much. 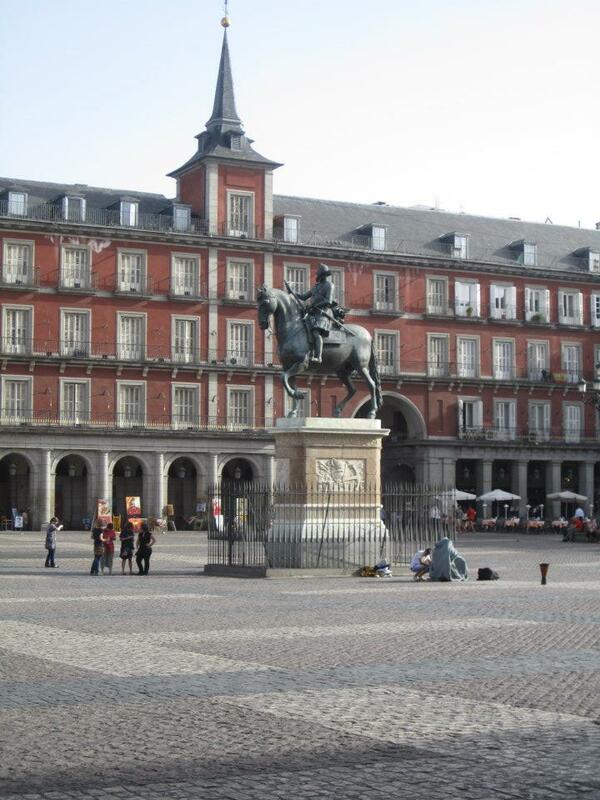 In the morning, we’re going to have a group orientation where we will purchase our school books, take a tour of the campus, do whatever else the orientation entails, and take a trip to Madrid (which is only 25 minutes away from us) to check out some of the big tourist attractions. 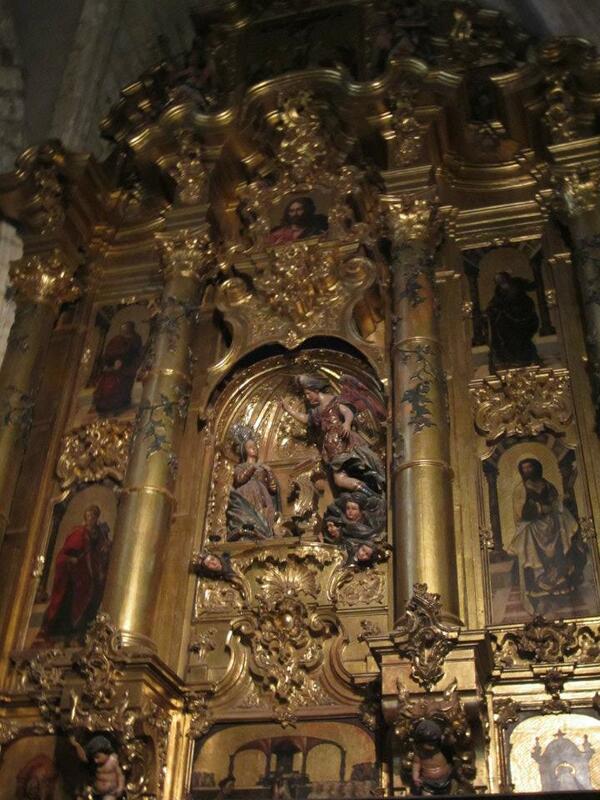 That’s it for now, but I will leave you with this; a new addition to my posts here in Spain. 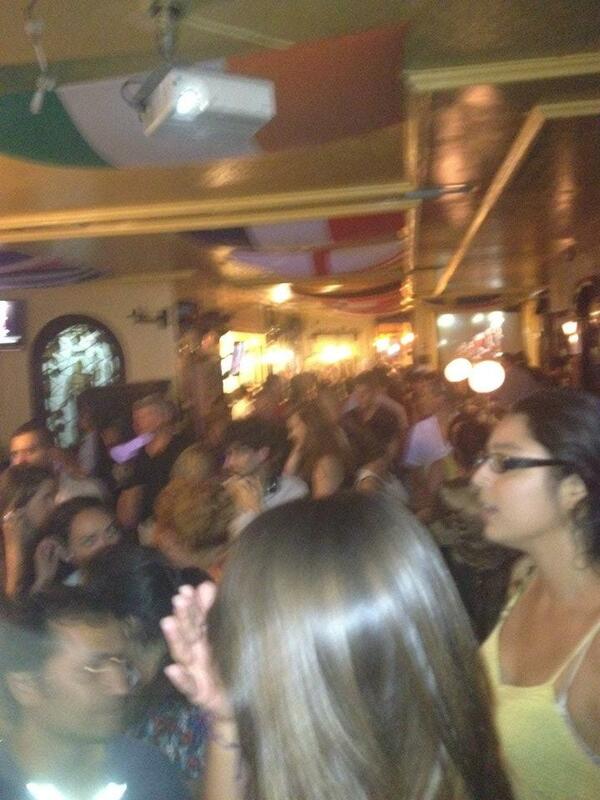 The bar where we watched Spain beat Portugal! Last night, my friend and I decided to walk around the city, and decided to eat dinner at a local pescaderia, a fish and seafood restaurant. 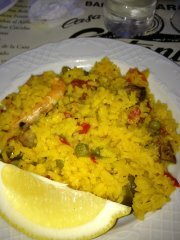 Of course I made sure to order Paella, a dish traditional to Spain (Valencia in particular) consisting of rice and various meats and/or seafoods.After dinner, we continued to walk around and came across a bar with free flamenco singing and dancing. We stayed for the show, which was awesome, and after a long day of traveling, went back to the hotel. Having spent all of today traveling around Sevilla, I realized that there’s a lot more that the city has to offer than one may think. First off, we walked around to check out all of the local shops and restaurants. 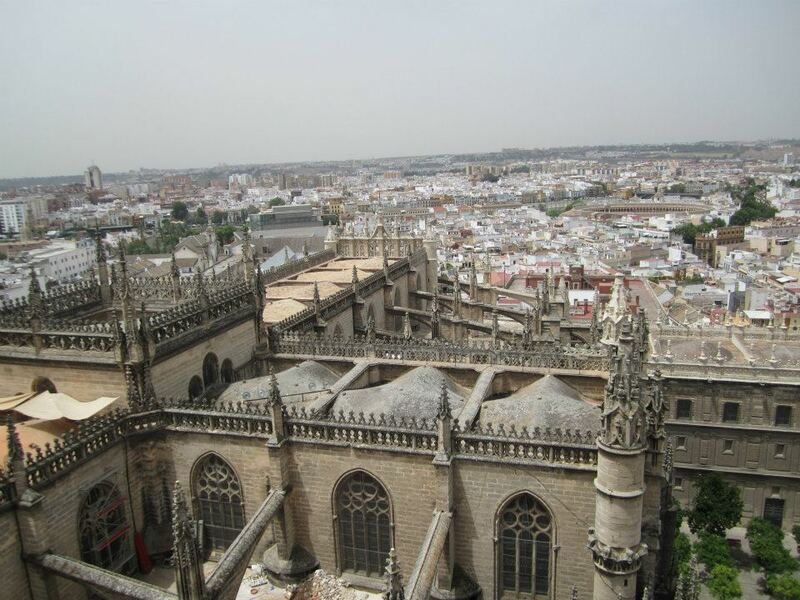 We then entered the Catedral de Sevilla which is the largest Gothic Church in the world and the third largest church in Europe (after St. Peter’s in Rome and St. Paul in London). 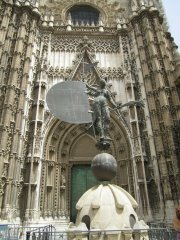 The cathedral claims to contain the remains of Columbus, and the golden centerpiece is the world’s largest, containing 2,000 statues, illustrating 45 scenes from the Bible. 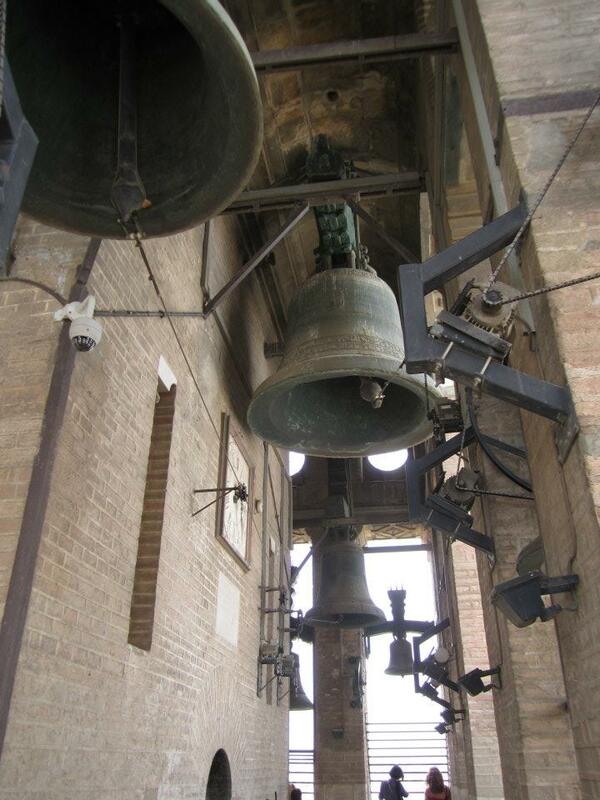 Next to the cathedral is La Giralda bell tower, the city’s most recognizable monument. 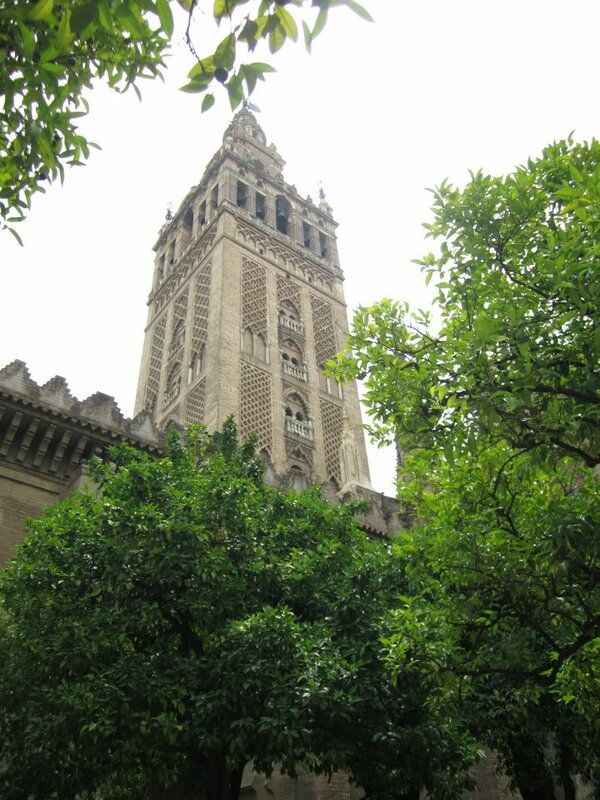 The lower two thirds of La Giralda are from the late twelfth center, and are the “minaret of the city’s old mosque.” The top part, or the upper third was added later on to house the bells, and at the very top stands the Giraldillo, not only a weather vane, but the largest bronze sculpture of Renaissance Europe. 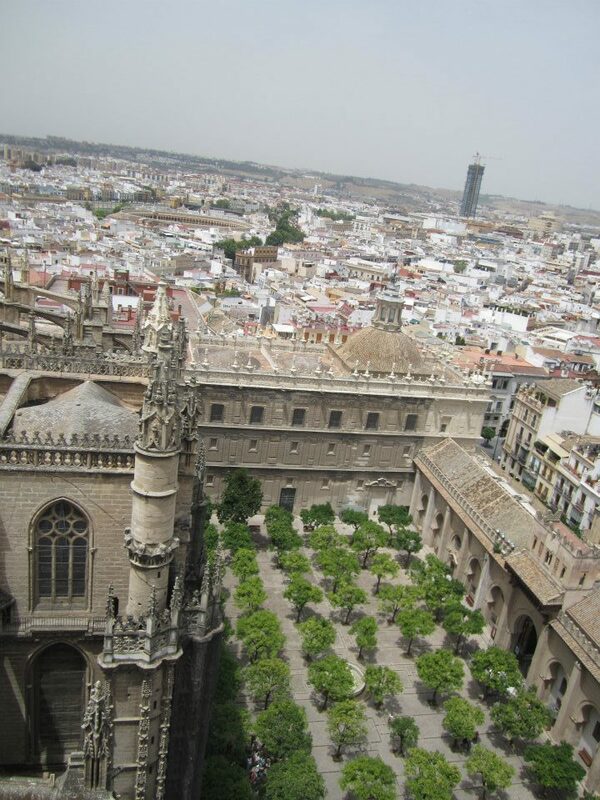 Upon leaving the Cathedral and Giralda Tower, we exited through a patio of orange trees, seeing as Sevilla is home to over 20,000 bitter orange trees, whose fruits are often exported to England to make marmalade. 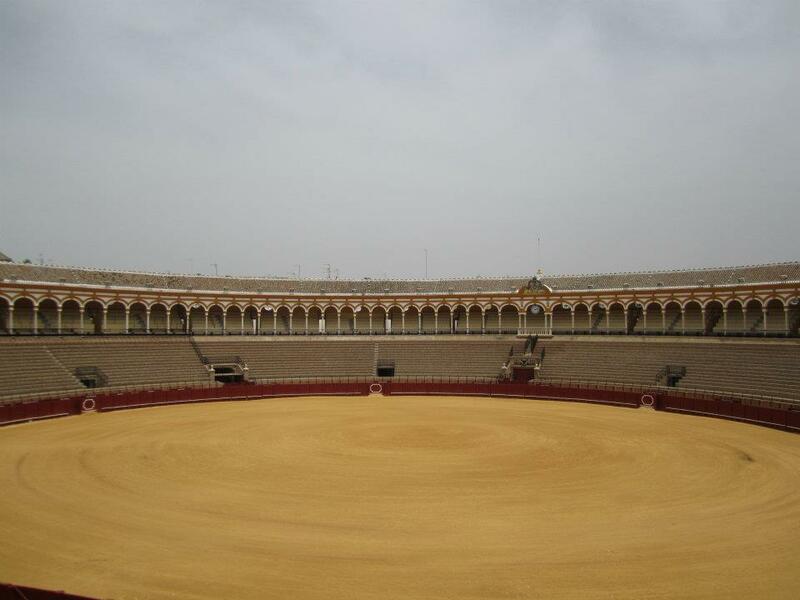 The next stop on our list was the Plaza de Torros de la Real Maestranza, the bullfighting stadium here in Sevilla. 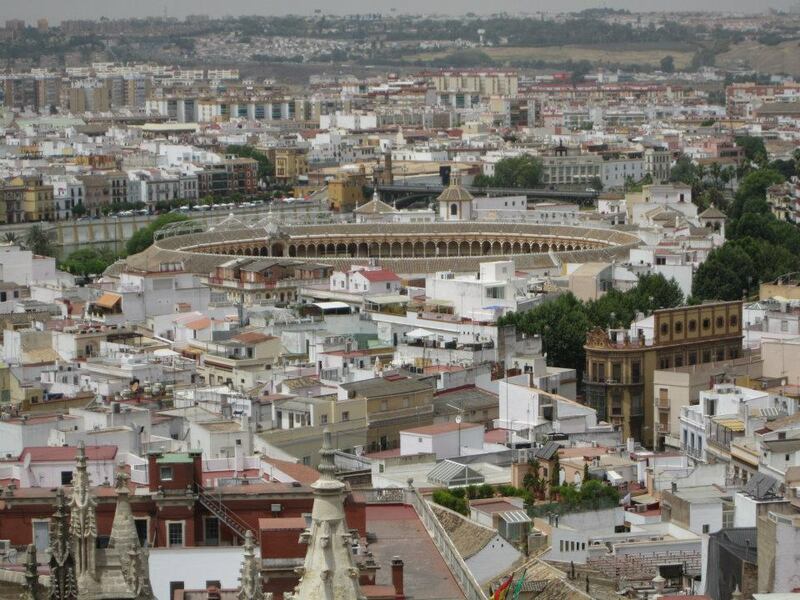 Bullfighting takes place from the months of April to October and with only 12,000 seats in the stadium, Sevilla is known as the birthplace of modern bullfighting. 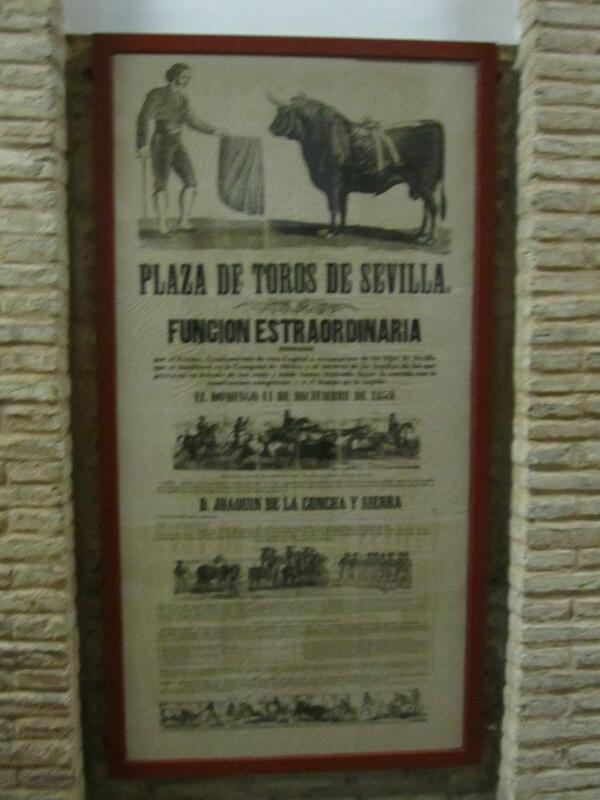 We walked around outside, saw the four main entrances and exits for the main bullfighter and for the bulls. 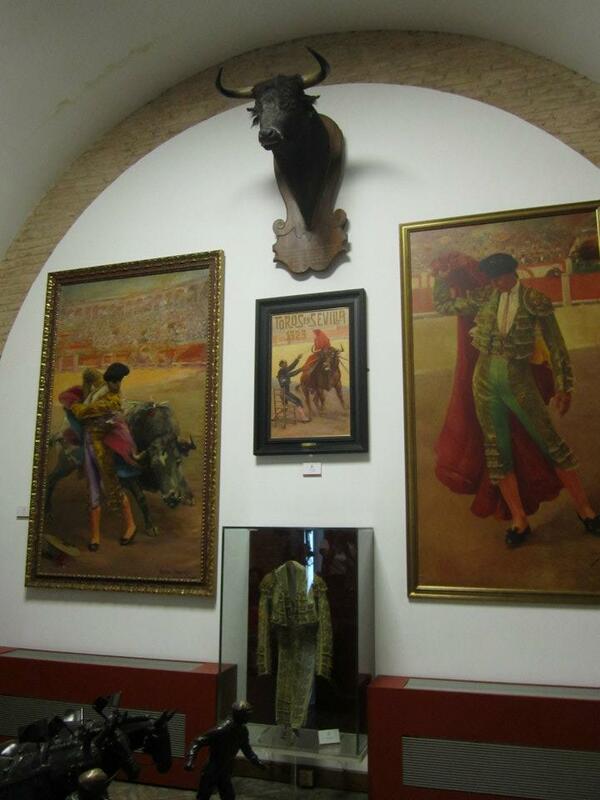 One entrance is for el torero, the main bullfighter, should he win the fight. Only one or two toreros actually win a bullfight each year, sometimes none, but there is a special exit for them in which they get carried out by the crowd in celebration. A second entrance is for the bull to enter, another for the bulls to exit if they’re dead, and the last one is an exit for the main bullfighter to be taken to the hospital, should he need immediate transportation. After seeing the plaza de torros (bull-ring), we were then shown a museum with interesting artifacts dating back to the seventeenth century, a room serving as a cathedral for the toreros to pray before the fight, as well as where the horses and mules are held (Picadores, or lancers, ride horses alongside the toreros and acts as aids, should it be necessary. Mules on the other hand are brought in at the end of fights to help carry dead bulls out of the ring). After learning the history of bullfighting and seeing how interesting it looks, you can bet that I’m going to try to go to one before my trip ends! After spending the remainder of the day walking around and taking in the sights, dinner was definitely something I was looking forward to. 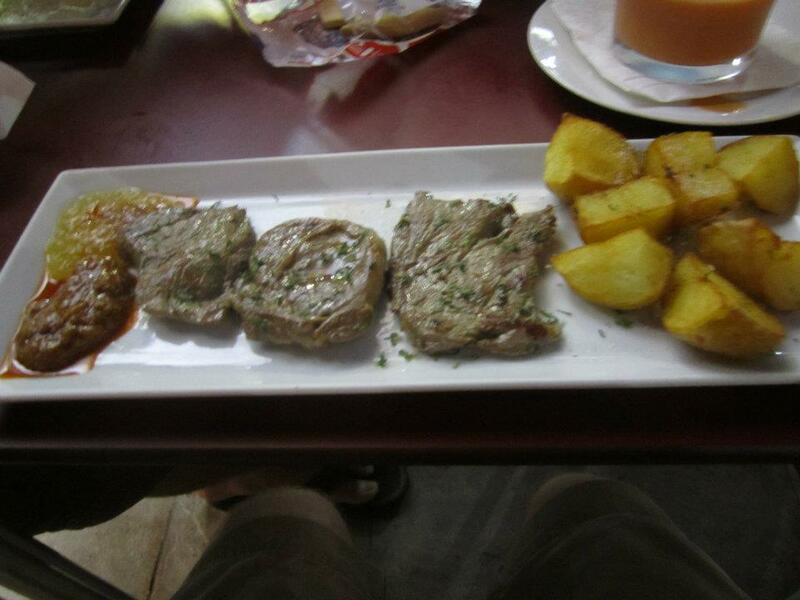 I made sure to order Gaspacho, a traditional tomato based soup with cucumber ice cream, and tapas de solomillo y patates, steak and potatoes. The dishes were incredible, and the idea of tapas, finger foods, originating in Spain, is pretty cool, considering you get small bites of delicious foods, which still fill you up. No trip would be complete without annoying traveling stories, and although it’s only my first day here, I have plenty. Yes, I try to keep my posts inspirational to help others, but sometimes we need to vent, and if the airlines won’t listen to my complaints, I figured someone here would, so thanks in advance. Even though I’m from South Florida and go to school in Orlando, the Tampa International Airport offered the most inexpensive ticket prices, so I decided to start off there. My flight was delayed a while not because of the torrential downpour taking place due to Tropical Storm Debbie, but because the airline’s generator wasn’t working, so they had to wait for a mechanical engineer to take a look at it. We finally left three hours later (in the tropical storm bands), and were on our way to the Dulles Airport, where we would then take a connecting flight to Madrid. My friend who is traveling with me and I were told that we would be missing our connecting flight and would have to spend the night in a hotel by the airport, complements of our airline. As we landed, however, the stewardess made an announcement for us to go speak with her when we got off the plane, and when we did, she told us that our connecting flight was delayed due to potential gas leakage problems, so we took off to the gate. Of course it was one of the furthest gates away from us, but we made it in time, and were told by the crew that we were extremely lucky to have made the flight. Once we sat down, the already two-hour delayed flight was further delayed an hour and a half. We took off and upon arriving to Spain, we found out that our luggage hadn’t made it, and wasn’t yet traced to any particular airport. There’s no need to further complain, so I’ll stop it at that and change the subject. 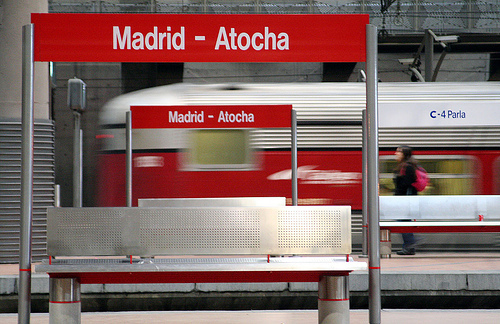 Since my friend and I have plans to spend the next to nights in Sevilla, we boarded a bus which took us to the Atocha Train Station in Madrid, and we hopped on a two and a half hour train to where we will be spending the next few days. We plan on walking around a little later, so upcoming posts will be much more interesting, but the culture shock has already begun to kick in. You can clearly tell that the people here in Spain have their own unique accent with the infamous lisp that Spain is associated with. The crowds and crowds of people in the train station, the overwhelming amount of people on the busses, and only fragments of English being spoken by passerby tourists makes it somewhat uneasy to be away from home, but somewhat exciting as well. The two definitely balance each other out and all I can hope is that I pick up more the language and fast (and get my suitcase too). That’s about it for now, but there will be plenty more to come soon, and lots of pictures as well. As I mentioned a while back, today is the day I am going to study abroad for six weeks in Spain. Since I was younger, traveling to Spain seemed to make it on my to-do list each year, so I guess I’m finally getting around to crossing that off the list! I’ll be staying with a host family in Alcala, forty five minutes outside Madrid and traveling as much as possible on the weekends. I think it’s fair for me to speak on behalf of us “Word-pressers” when I say that we love looking at pictures from other trips and hearing about amazing excursions from fellow bloggers, so I’ll be trying to best to blog about my experiences in a new country, a new school, speaking a different language, and of course the exciting travels which will be taking place as much as possible. 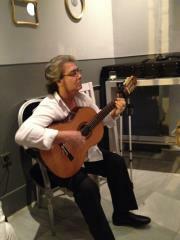 Here we are on Day One as I head off to Spain! Let’s begin the journey, shall we? Let’s talk about those infamous fears that tend to obstruct our every day lives. Such fears include that of meeting new people, the fear of being alone in the later years of your life, or even the fear of not being able to accomplish your goals. Sometime or another, we have all found or will find ourselves facing at least one of these fears, or maybe something else along these lines. In no way is having these fears a terrible thing because let’s face it, if you didn’t have these fears, well, I would probably fear for you. When it comes to thinking about one’s future, who’s to say what will or won’t happen? No one really knows, so a bit of uneasiness or anxiousness is perfectly okay. But when you fear something to the point of it getting in the way of your every day life, that’s when we find ourselves with a bit of a problem. Some people are afraid of making new friends, some fear for never meeting that special someone, and other may be afraid of not accomplishing their life-long goals. Well, to overcome such fears so that you can ultimately make new friends and meet a partner to get romantically involved with, you’re going to have to put yourself out there and give it a shot. There is nothing to lose, except your shyness and your fear. We all need to be around people every so often, because seclusion can eventually lead to depression, which then leads to needing a psychologist, and we all know how pricy that route tends to be. In a recent post of mine, I mentioned that we should all love unconditionally. A fellow blogger commented saying that he used to love unconditionally, but it’s difficult to do so because love is a two way street. When it comes to meeting new people or new prospects to become romantically involved with, regardless of the circumstances, think of yourself as a magnet, if you will, and imagine that wherever you go, people will be attracted to you. If you are meant to be friends with someone or be with that person on a more intimate level, then you will magnetize that person. On the other hand, if you are not meant to be friends with someone, you will simply repel one another, and that will be the end of it. In order to see the process of magnetism in action, you have to make some kind of an effort when it comes to introducing yourself to others around you. Don’t count on others to come over and introduce themselves to you, because if you keep waiting for that to happen and it never does, you’ll end up spending the rest of your life just waiting. Making friends is a work in progress, and if you don’t make friends right away, keep in mind that the time will come when you will eventually meet someone with whom there will be mutual attraction or magnetism. Close your eyes and imagine yourself overcoming a situation in which you fear meeting new people; you fear of talking to someone whom you hope to become romantically involved with; or you fear accomplishing certain objectives and goals that you set out for yourself. See the success of you conquering your fear. Feel yourself achieving great things in life. These fears that you hold on to are doing nothing but keeping you down, so why not break through the glass ceiling which has been hovering over you for so long? You can accomplish anything that you set your mind to so open your eyes and overcome these fears. A while back, a friend of mine gave me a to do list that I hung up in my room, which is a constant reminder of various important lessons that we should work to incorporate into our lives on a daily basis. I hope you all enjoy this as much as I do! First off, Happy Father’s Day to any and all fathers out there! I figured that today would be ideal to post about being appreciative for all that we have, while tying it into my most recent trip to Guatemala. 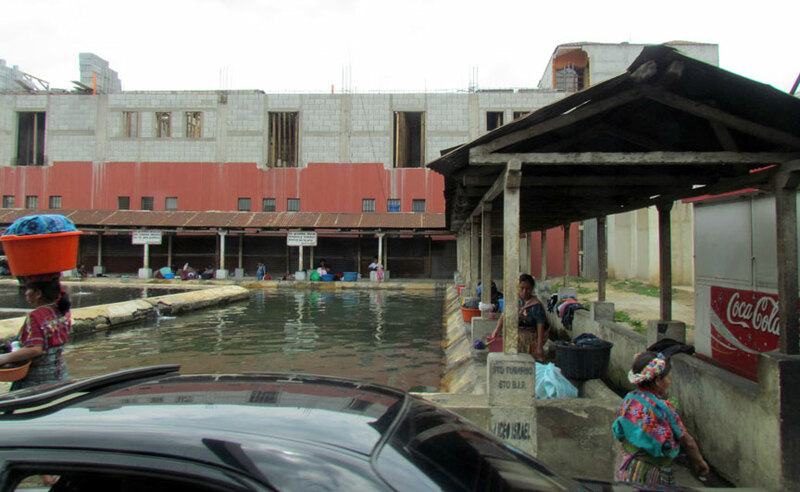 In the city of Sumpango, the women bring their laundry and dirty clothing to the central washing area. Imagine sharing a centralized watering area with all the people in your city, thus leading to scabies, rashes, and other such bacterial problems. What about shoes? Not everyone in this city is fortunate enough to have shoes, so imagine having to walk to and from work everyday barefoot. Not to mention one of our basic needs in life: food. Many of the parents here give their kids milk with sugar because it’s the most inexpensive meal they can afford on a daily basis. With dental hygiene not playing a huge role in the lives of so many, imagine what this does to the teeth of these people after years and years of constant sugar and no dental hygiene. Instead of dwelling on how badly others may have it, or how lucky we are compared to others, let’s think of how lucky we are. Period. A little appreciation each day goes a long way, so when we can truly be thankful for all that we have, we’ll understand the importance of giving back to those in need.